Welcome to the second installment in our Xero ‘How To’ video blog series! In this latest episode, we look into the very basics of managing your list of contacts within Xero, including how to add new contacts, edit them, or archive the contact if no longer required. We are staunch supporters of Xero cloud accounting software, and believe that if properly utilised and integrated, it can have real positive impact to the day-to-day operations of the business. One of the first steps to efficient integration is understanding how to manage your contacts list as this forms the base of tracking suppliers, customers, and invoicing within Xero. 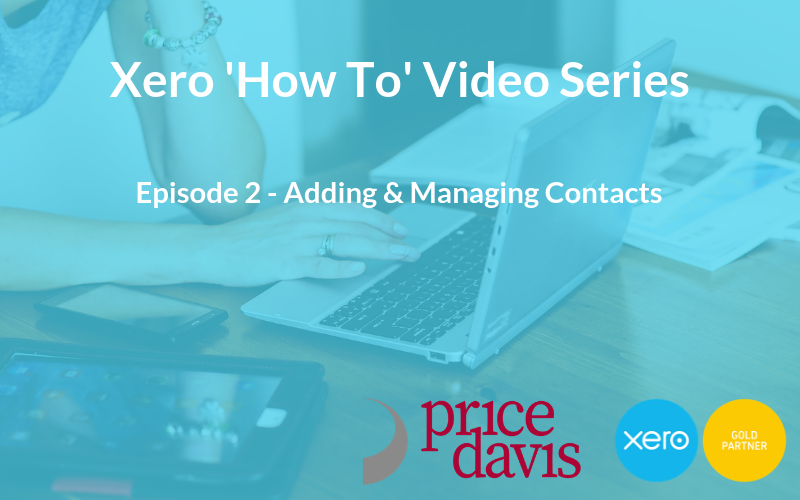 We hope that after watching this you are now confident with adding and editing contacts within Xero. As with all episodes in the series you can re-watch this video, and watch future videos in the ‘Xero How To Series’ on our newly created Business Resources page on our website! If you have any queries regarding Xero Accounting Software please feel free to contact our Xero support department on support@pricedavis.co.uk or give us a call on 01452 812491.